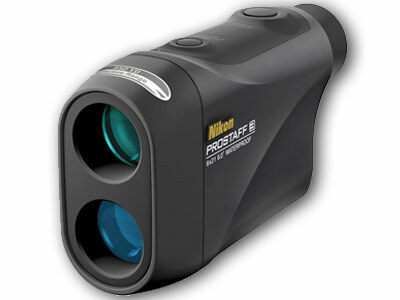 The ProStaff 3 6x21 Laser Rangefinder from Nikon is a hunting accessory designed to measure the distance of targets up to 550 yards away. Tru-Target Ranging technology is designed to accurately measure range in a variety of terrain and weather conditions. The 6x magnification is suitable for identifying targets at mid-range distances. An in-view LCD display and auto-off power function allow you to monitor and conserve battery life. Multicoated optics, weather sealed housing, and one-touch laser activation make this rangefinder a full-featured optical instrument for hunting and other outdoor sports. Metering Range Measure from 11 to 550 yards down range with 0.5 yd increment readings. One-touch activation button emits the ranging laser. Automatic power-down function deactivates the laser after 8 seconds to preserve battery life. Measurement technology designed for accurate ranging in various hunting conditions and terrain. Waterproof and fogproof housing (except battery chamber) is built to withstand light rain and humidity.